I was given this old AST Bravo II computer for free without a hard drive. 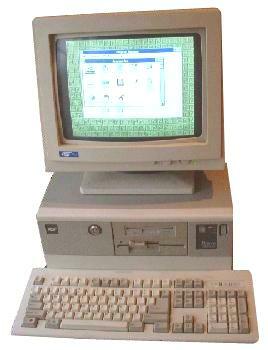 This computer contains a 386SX microprocessor and a motherboard with built-in video and HD/disk controllers. The old BIOS in the computer was quite picky with the type of HD installed. If it was too large or modern the BIOS would not see it in the system setup or function properly. An old 35MB hard drive with Windows 3.1 preinstalled was inserted and worked successfully.